The It Girl of the moment is not the usual tabloid train wreck. She is not a Kardashian, a teen mom or Lindsay Lohan. Like a slew of other celebrities, she has an impending wedding but is not an actress, reality television star or self-entitled socialite. She is Kate Middleton, a pretty British brunette and the daughter of a former flight attendant and a flight officer. She is currently engaged to her college sweetheart, Prince William of Wales – heir to the throne of England (aka the future King of England). Forget Bieber fever (we’re too old, anyway). Single girls are crazy for Kate. 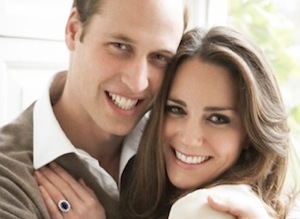 Since Kate Middleton’s engagement to Prince William, the future King of England, she has inspired a nail polish color called “No More Waity Kaitie.” (She’s been dating William since 2001 – see what they did there?) The blue Issa dress she wore during their wedding announcement was sold out within 24 hours in London. The white Reiss ensemble she wore in their engagement photo (taken by celebrity photographer Mario Testino, of course) was from her own closet and sold last fall. No longer available in stores and because of Kate, it has been resurrected from the fashion vault, re-made and re-sold. Each day, our fingers are poised above our Twitter feeds eagerly anticipating the latest news on the Royal Wedding taking place April 29. (Yes, we have it marked on our calendars, and yes, “Royal Wedding” should be capitalized.) Royal honeymoon location revealed! Bridal party announced! Kate quits job to plan wedding! Invitations have been mailed! (They invited Kanye West?!) Today, the Royal Couple launched a RAFT. On other slow news days, the press will leak baby photos of Kate Middleton or continue to speculate on the designer of the Royal Wedding Gown. Our recent obsession with Middleton and her Royal Wedding is nothing new. Before us, our mothers had Lady Diana’s marriage to Prince Charles. Before her, our grandmothers had Hitchcock heroine Grace Kelly’s marriage to Prince Rainier of Monaco. Prince Rainier and Grace Kelly’s Royal Wedding, was dubbed "The Wedding of the Century." Kelly's family offered the Prince a dowry of TWO MILLION DOLLARS. She then sailed to Monaco from American with her bridesmaids, family and EIGHTY pieces of luggage. Her wedding dress was produced in six weeks by THREE DOZEN seamstresses! Lady Diana’s “fairytale wedding” was televised to 750 million people around the world. Her sapphire engagement ring is surrounded by 14 DIAMONDS. (Kate now wears it.) Her bridal gown had a train measuring 25 FEET and was made from 10,000 pearls! At their reception, the couple had 27 WEDDING CAKES! What is it about a Royal Wedding that sets a single girl into a grand ol’ tizzy? It’s simply princess envy. As with everything else, we’re blaming the media for our single girl insecurities. Specifically, the origin of all this princess envy stems from those silly Walt Disney movies. Cinderella? We want her shoes. Snow White? OF COURSE, we’d like to be “fairest of them all.” Sleeping Beauty? Her dress CHANGED COLORS and we’d actually like to take a nap right now. Ariel? We're jealous of her, ahem, “sea shells.” And Jasmine? Our abs don’t look like that. Growing up, did we ever want the doctor Barbie? No, we wanted the Barbie with the big poufy princess-inspired ball gown. We don’t necessarily need the titles, the 18-carat sapphire, the ridiculous wedding gown, the security detail. When it comes down to it, every single girl just wants to be treated like a princess. And we’ll kiss as many frogs as we can if it means we’ll someday find our prince.